You might not be able to judge a book by its cover, but people still judge a house by its fence. If your fence is looking a little worse for wear and you’re thinking of replacing it, you may be overwhelmed by options. Your mind has probably floated to the age-old question: wood or chain link fence? But are there other options you aren’t considering? So when it comes down to it, what is the best fence for your home? We’ll help you break down the options and give you a little bit of insight to the other fencing options, which could be the best kind of fence for your home. This beautiful wood fence was designed by Central Fence Co., Inc.
How long will it last? A wood fence usually lasts 10 to 25 years with regular maintenance. The lifetime will be significantly shorter if the wood is untreated. Cedar and redwood fencing will typically last longer than spruce and pine. When you think of a fence, you probably are reminded of a charming white picket fence behind a darling Victorian home. Now, like most things, wood fences are more complicated than they originally seem. Installing wood fencing will be cheaper than installing pretty much any other type of fencing, but that doesn’t mean that it’s the best option (or that it’s the long-term cheapest option). Wood fences require regular maintenance and must be repainted or re-stained every few years, to preserve its beauty. Remember Tom Sawyer painting a fence white? Unless you can pull a Tom Sawyer and convince passerbys to paint itfor you, you’re going to be stuck doing all of the hard work. And the cost of all of that paint? It adds up over the years. Over its lifespan, wood fencing may be as expensive as alternatives. This chain link fence is charming, with a cute potted flower. Installation and image by Kurb-It. How long will a chain link fence last? 15 to 20 years. The smaller the space between the links is, the longer it will last. Reminiscent of The Walking Dead, there’s nothing warm about chain link fencing. While you may be turned off from chain link fencing because of this, you should know that there are ways to make it cozier than an angry horde of zombies. And chain link fencing doesn’t need to be accompanied by a worn down house. You turn it into a beautiful trellis by growing flowering vines along its base. Check out this list for some of the best flowering vines, which you can cover a chain link fence with and make it much more beautiful. Chain link fencing is affordable, durable, and relatively maintenance free. If the fencing gets damaged, it’s relatively easy to repair. For a more aesthetically pleasing version, you can purchase it with a black vinyl coating. How long will it last? 15 to 30+ years. As long as you look out for rust, and eliminate it soon after it appears, your ornamental metal fence could easily last a lifetime. An ornamental metal fence can exude class and elegance. They are also extremely sturdy and low maintenance — a winning combo, if you ask us. Once used exclusively for fencing in gorgeous mansions, they are now being used more often. You can purchase a customized fence, designed especially for you, or purchase a manufacturer’s pre-designed piece. This vinyl fence is an updated version of the classic white picket fence. Design and image by Cascade Fence and Deck. How long will it last? 20 to 30 years; however, some vinyl fencing companies offer lifetime guarantees. Think of a vinyl fence as a fancier version of a wood fence. Without the wood. Although it initially costs more than wood, it will probably cost less over its lifetime. If you regularly clean it (and nothing absolutely wild happens) the fence could last for as long as you live in the house. Unlike wood, there’s no chance that the fence will rot, split, warp, or splinter — all things which could happen with a wood fence. If you’re worried about the aesthetic of a vinyl fence, look into the options a little bit. They can come in a range of colors and finishes. Vinyl will obviously never look exactly like wood, but unless you’re desperate for a Home Improvement fence conversation, vinyl could be the best option for you. How long will it last? 20 to 30 years. Keep an eye out for a manufacturer that offers a 20 year warranty. Let’s say you really want that Home Improvement fence conversation. Vinyl isn’t cutting it, but you’re worried about some of the drawbacks of wood fencing. A composite fence might be the right choice for you. Composite has a similar lifetime to vinyl, but it looks more like wood. In fact, it is (engineered) wood. It’s environmentally friendly to boot. 95% of materials used in its production are recycled. Unfortunately, once it’s manufactured, composite can’t itself be recycled. It’s also available in fewer styles than vinyl or wood. But, if you find a style you like, then what does that matter? Replacing a fence is a huge investment, but a new one does wonders for a home. It won’t dramatically increase your home’s value if you’re thinking of selling your house, but people will appreciate the privacy the fence can provide. And even if you’re not planning on selling, it can make your house feel more like a home. 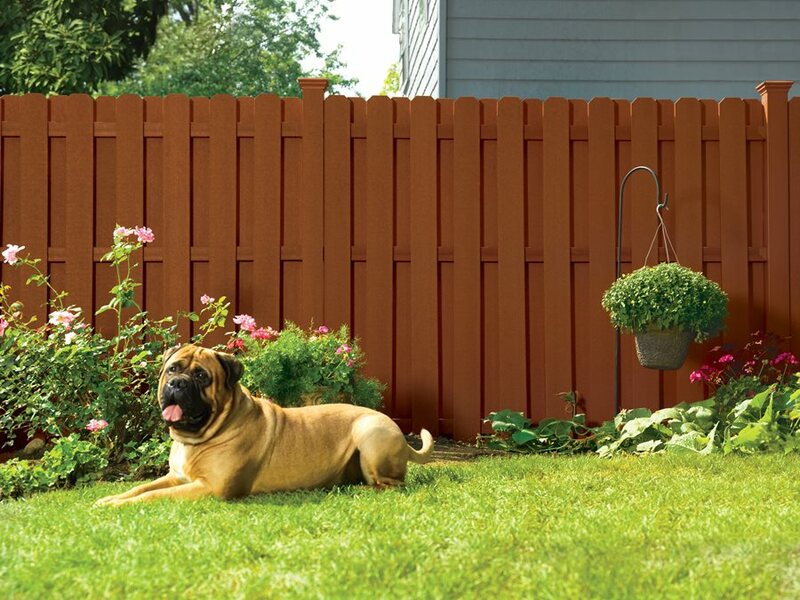 A nice fence will frame your yard, giving plenty of space for your dogs to frolic and for your kids to have water balloon fights. And, for you to have a nice glass of wine. You can find the best fence for your home, we believe in you!